Omagari Fireworks Festival is one of Japan's greatest fireworks festivals. 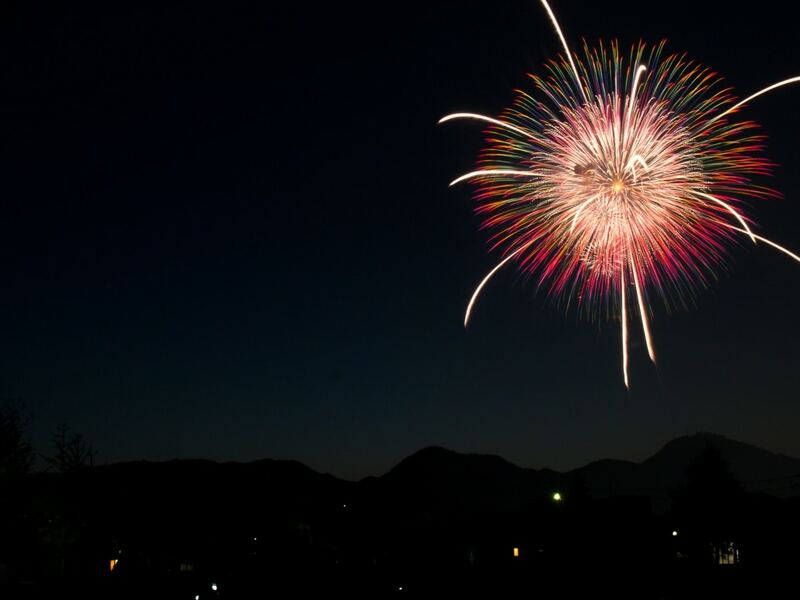 Once a year, over 20,000 fireworks and 800,000 attendees gather in this quiet city in Akita Prefecture. If you want a brand new Japanese firework experience that can't be found in a big city like Tokyo, look no further! Omagari is a part of Daisen City, home to 80,000 people. It's situated in a flat land east of central Akita with plenty of rice paddies and farms. In fact, Akitakomachi rice is one of its most famous products. While Daisen isn't exactly a bustling city, it plays host to one of the most important summer events in northeastern Japan. Once a year, this city is the setting for Japan's most explosive event, the All Japan Fireworks Competition. The event is more often known as the Omagari Fireworks Festival. The fairground is situated near the side of Omono River, a beautiful river that runs through Akita Prefecture and drains into the Sea of Japan. 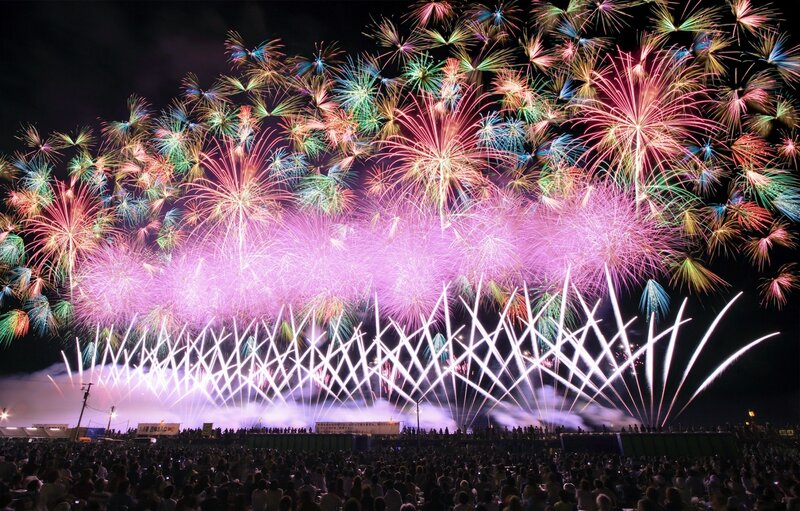 Omagari Fireworks Festival has boasted over 800,000 visitors despite being held in a relatively remote area. Statistically, it's one of the biggest and most popular fireworks festivals by any standard. On average years, 15,000- 20,000 fireworks are shot at this event. To put that into perspective, the Sumida River Fireworks Festival once claimed to have 950,000 visitors. But it's held in Tokyo, a mega city with a population reaching ten million. The festival is competitive, inviting makers of fireworks from all over the country, and sometimes even overseas, to display their works in the festival. There are large varieties of fireworks exhibited at this event, from standard to very unconventional displays. They are all pleasing to the eyes and deserve to be called art. Some pieces feature tons of fireworks shot at once, some only involved lonely, but dazzling, firework. If you want to go, first, you might want to decide if you want to book a seat in advance. Most fireworks are arranged so that they're the most beautiful when viewed from direct front. If you absolutely want the best view, you will have to book your place. Head to the official site to reserve your tickets (below), which goes live around every April, four months before the actual event in August. The site is, however, only available in Japanese. There are also some foreign websites that offer package tours, which include transportation and accommodation. However, these can be quite overpriced. If you don't reserve a spot, you'll have to look for an opening or head to one of the parks in Omagari. Many of these public areas will already be occupied by locals. However, I had an easy time getting a space for my mat, camera tripod and some bags. There were some trees in my field of view but if I backed up a little, I could have a clear view of fireworks easily. Personally, I recommend not reserving a spot, but do get a hotel in advance. Daisen City is home to 80,000 people and it has nowhere near enough hotel rooms for 800,000 visitors. Building a new hotel for a one-day event also isn't the most sustainable thing to do, so the lack of hotel room situation will continue for as long as this event continues. You can try to get a hotel close to Omagari Station (near impossible) or you can ride the evening train from nearby cities, such as Akita, Yokote, Yuzawa or Shinjo. I could only get a hotel in Shinjo City, a large city that's 100 kilometers (62 miles) away from Omagari. Take note that the hotel situation is really, REALLY tight because the surrounding area is relatively rural with few hotels. - If you don't mind the view, it's absolutely possible to go there without reserving a spot. In fact, the event doesn't have enough reserved seats for everyone. It's pretty normal for people to pick a spot in a park and watch. - Respect the locals! This is a small city with a population fewer than 10 percent of the total visitors. Don't enter private lawns or park in their driveways. - Do book a hotel room in Omagari well in advance or be prepared to take a train to Omagari on the day of the festival. - You can drive there, but parking requires reservation too. You have to pick between reserving a parking space (which requires Japanese language ability) or walking a really long distance. - The toilet situation is also really tight. If you arrive early, one of the must-dos is to survey the toilets. Omagari Station is actually a relatively important station in the area and, thankfully, has shinkansen access. You can use Akita Shinkansen to go to Akita City and stay at a hotel there. There's even a shinkansen that heads back to Tokyo so you can book the hotel near any station along the line. Note that the shinkansen heading to Tokyo ends really early. The final train to Tokyo, at the time of this article, is 7:43 p.m., compared to the 11:23 p.m. shinkansen heading to Akita Station. Editor of All About Japan Thai. OK at writing, much better at asking people to write. Only ever own one belt.